Take I-94 toward Jackson. Take exit 138 (Route 127 north) toward Lansing. Take Berry Road exit. At end of exit ramp, turn left. Berry Rd dead ends into Rives Eaton Rd—turn right at the stop sign. The Monastery is 1/4 of a mile down the road on the left hand side. Take Route 127 North or 50 North to I-94. Take I-94 toward Jackson. Take exit 138 (Route 127 north) toward Lansing. Take Berry Road exit. At end of exit ramp, turn left. Berry Rd dead ends into Rives Eaton Rd—turn right at the stop sign. The Monastery is 1/4 of a mile down the road on the left hand side. Take Route 127 south to Berry Road exit. At end of exit ramp, turn right. Berry Rd dead ends into Rives Eaton Rd—turn right at the stop sign. The Monastery is 1/4 of a mile down the road on the left hand side. All Services are in both Romanian and English. During Great Lent and on major Feast days, times of services may vary. 5:00 Matins, First Hour, Third Hour, Sixth Hour, Typica. Divine Liturgy is served on Wednesdays at 7:00 AM. 5:00 PM Ninth Hour, Vespers, Small Compline. 6:00 PM Vespers with Litiya, Matins and First Hour. 9:00 AM Akathist Hymn, Third and Sixth Hours. 6:00 PM Unction Service on one FRIDAY of each month. Check the monastery’s website for further information. For a complete list of upcoming services, please visit the Calendar page on the monastery website. Other services (memorial services, Unction services, etc) can be offered upon request. Please call the Monastery to make arrangements. They spent almost nine years in Ellwood City. As would be the case later, Mother Benedicta’s lifelong experience of monastic life brought to the Ellwood City community a wealth of knowledge based on the tradition of Romanian monasticism. At the same time they had the opportunity to become familiar with the American society in general and the Orthodox society in particular. The time in Ellwood City had prepared them for the years that were to come. After a long and tedious search in which they were assisted by a number of friends and acquainteances, they found the Rives Junction property. The property is located in a small rural town, set in sleepy southern Michigan, about seven miles north of Jackson. The establishment of the monastery at this particular location is not necessarily odd. Geographically, Rives Junction is within an hour or two of most of Michigan’s major cities: Detroit, Lansing, Kalamazoo, Ann Arbor, and of course, Jackson. It is also within three to four hours from Cleveland and Chicago. With the aid of substantial donations from a couple of devout parishes, and the proceeds of nine months of their own labor in sewing vestments, altar covers, and the like, they were able to pay off the mortgage on the property in only 8 months. From 1988 on the tiny community slowly but steadily began to establish itself. The tale of these years is a tale of many consecutive small miracles, as people often came forward to help without solicitation. A couple of local families became almost immediately instrumental in helping them establish the monastery. The original property consisted of a farm house, a pole barn, and a garage. The pole barn was first transformed to accomodate the church, and was named in honor of one of the Church’s great feast-days, the Dormition of the Mother of God. The Dormition is one of the major holy days in Orthodoxy. The Romanian Church of SS Peter and Paul in Dearborn Heights donated the Iconostasis. The first Liturgy served in the Chapel took place on the Feast of St Elijah the Prophet, on July 20, 1988. In order to accomodate visitors, a guest house was built. In 1993 an open air pavilion was built that serves as a Chapel for the Dormition Pilgrimage and other large gatherings during the summer months. On the Feast Day (August 15), an average of 600 people attend the services. The community grew steadily and rapidly. By 1992 three novices and a professed nun from Romania had joined the community, as well as three others already in the United States. In five years time the community tripled in size. Today, the community numbers nine sisters. Also in 1992, Mother Benedicta, wanting to retire from the public leadership of the Monastery, passed the herald onto Mother Gabriella. On the Feast Day of the Dormition that year, by the grace of God and with the blessing of His Grace Bishop Nathaniel, Mother Gabriella was installed as the new and second Abbess. Mother Benedicta took the stricter vows of a Great Schema Nun. On August 7, 2005, Great Schema Nun Mother Benedicta fell asleep in the Lord, after a long illness. She will be greatly missed by all those whose lives she touched. The legacy she leaves behind will continue under the spiritual direction of Mother Gabriella. Today, sewing continues to be a significant part of the income generated by the monastery. To that a few other activities have been added, such as making prayer ropes, decorating eggs, mounting icons, hand painting icons, speaking engagements and hosting many retreats at the monastery for groups of all ages. To all this can be added the work that is necessary to sustain the life of the community and to offer generous hospitality to all visitors. A large vegetable garden provides fresh vegetables all summer long as well as enough produce for canning to last for the winter. The monastery also publishes a bi-lingual monastic journal called “The Burning Bush”. It is more than just a newsletter. It is a monastic journal that publishes religious and monastic articles written by the members of the community. It was started as a teaching tool, as well as a link between the monastic community and the community of the faithful, and educational and informational magazine. The goal was, and still is that each issue would include articles relating to topics of general interest. The mailing list for those who receive the journal regularly is over 2700 people, all over the US, Canada, & Europe. In the Romanian traditions the monastic settings have always been the centers for education. The first books were printed in the monasteries and through the monasteries were spread to the people. In keeping with this tradition, and desiring to provide a means of spreading the teachings of the Church to Orthodox America, the HDM Press Publishing Co was founded in 1994 and received with enthusiasm. To this date, four books have been published, and have been very well received. There are more scheduled to be printed in the months to come. Every monastery has its own cemetery, and the Rives Junction one is no exception. A two acre area was allotted to be used as a burial place for Orthodox Christians. There are many people today who rest in the beauty and tranquility of the cemetery. The graves are attended daily by one of the community members with incense, candles, flowers, and peace. The steady growth of the monastery and the increasing interest in its well-being exhibited not only by Romanian Orthodox but by all ethnicities of the faith led the nuns to embark on a development plan. The primary goal of this design and construction effort was to add the necessary spaces to accomodate the physical growth of the monastery. The secondary goal was the unification of the physical aspects of the existing buildings and landscape, to create a place that reflects our beliefs as a monastic community, which is continuous prayer; in other words, continuous communication with God. Expansion began in 1995 with the construction of the new Trapeza (dining room and kitchen). Expansion of the St Nicholas house was finished in the early spring of 1999. Completion of the new guest house took place in November 2001. 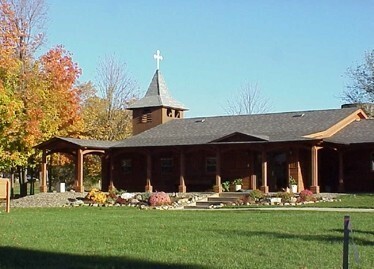 The addition to the cloister (the nuns’ quarters) was completed in the spring of 2005. It also houses the library, work rooms, and office space. It will provide space for the gift shop, receiving room and a more formal entrance into the monastery. The construction of the Gate House and Bell Tower were started in Summer of 2005. The Bell Tower has been completed and the Gate House was finished in the Spring of 2007. The Gate House hosts the gift shop and the monastery’s museum, and also serves as a place of reception for visitors. Finally, construction of the new church began in May 2010. The new church was built and completed in a traditional Byzantine style and is in the center of the courtyard. It was consecrated on October 6, 2012. The core principles that guide, unite, and sustain the monastery are nonetheless principles that find their source not in the innovations of the American Orthodox but in the traditions of the ancient Church and her fathers and mothers. There remains always a continuity to the past. The monastery is a place of living tradition. Perhaps this is some of its appeal to those who visit, who then find themselves transported back in time to the ancient Church or perhaps simply, to simpler times in general. But more important and more durable than the materials from which it is built, this monastery is and will always remain a holy place, a place for Orthodox Christians, a place with stable foundations, which time with its continuous changes will not be able to destroy because it was born out of the depths of Faith. The foundation of this monastery represents the unity of Orthodoxy and Faith and its continuity in this land. It is our hope and prayer that this holy place will grow, reaching the heights of all spiritual understanding.